First day of the Lotto Belgium Tour the riders faced a 4.37km prologue in Nieuwport. Normally Kirsten would be among the favorites, but due to a back injury she had to withdraw from the race. Charlotte finished as our best rider in 22nd place 26 seconds behind winner Annemiek Van Vleuten (Orica) and Simona in 23rd place 28 seconds behind. (CanyonSram) escaped the peloton and was joined by Sara Penton (Lares Waowdeals). Later the group grew to seven riders and at that point our girls took charge in the peloton. As the group was caught with one lap to go Charlotte joined a breakaway with four riders. By then the peloton had decided it was going to be a bunch sprint and the breakaway was doomed. In the sprint Simona, who is normally part of the teams lead out, finished to a good 10th. Lucinda Brand (RaboLiv) won the stage. Second stage had start and finish in Lierde with a finishing loop of 16.7km including the steep climb Eikenmolen. There were several attacks during the stage, but nothing would stick. Over Eikenmolen last time a group of around fifteen riders got a gap, but as the peloton approached the finish it was all back together. Again Simona finished strong and was 8th on the stage. The stage was won by Marianne Vos (RaboLiv). Last stage included Berendries and a local lap with the Muur and Bosberg done twice. Already from the start Alexandra Nessmar (LaresWaowdeals) attacked, she stayed away until the local laps where the peloton increased the pace. Up the Muur and over Bosberg the peloton split into several groups. 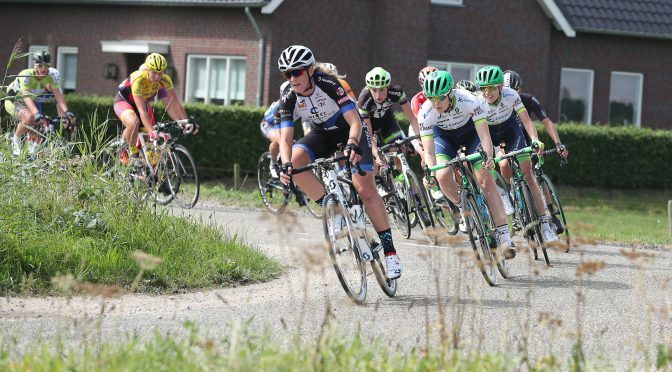 In the front Annemiek Van Vleuten got a gap and went solo to the finish for stage win and overall victory. Tatiana finished with the group behind to a 27th place while Simona, Thea, Julie and Charlotte all finished safely with the bunch on the uphill finish in Geraardsbergen. Next up for our team is the Madrid Challenge by La Vuelta on Sunday 11th of September. The race will be broadcasted live.